Bill Cosby ABC interview: Good Morning America sitdown produces softball questioning, nonsensical answers. 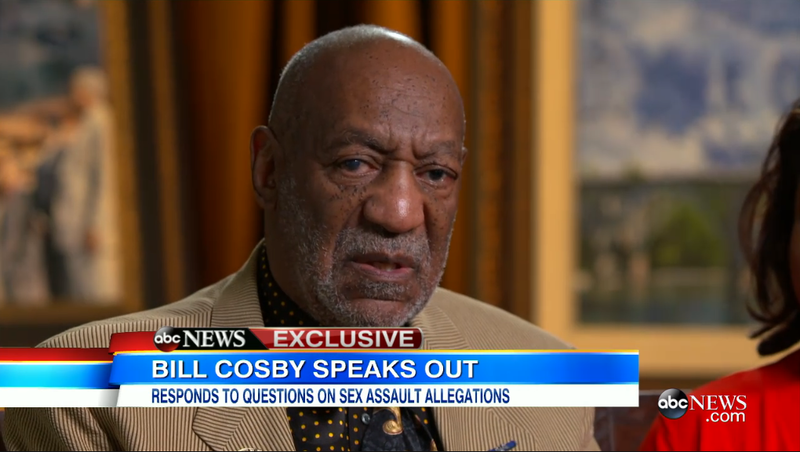 Bill Cosby in ABC’s interview. Are you prepared for the backlash if a young person comes up to you and says, “my mom says you’ve done some bad things”? How will you answer them? Did you do it, are you guilty? Are the allegations true? I’m not sure that they will come like that. I think many of them say, well, you’re a hypocrite. You say one thing, you say the other. My point is okay, listen to me carefully. I’m telling you where the road is out. Now, you want to go here, or you want to be concerned about who’s giving you the message? Are you concerned at all, given the allegations, that that may overshadow your message? I have been in this business 52 years and—I will—I’ve never seen anything like this. And reality is the situation. And I—I can’t speak. Some of your biggest supporters have said that they’re worried about your legacy. What would you like your legacy to be? I really know about what I’m going to do tomorrow. I have a ton of ideas to put on television. About people and their love for each other. More footage of the interview is set to air on Nightline; hopefully it will be more illuminating and on-topic than whatever this was. “My mom says you’ve done some bad things?” Come on!